Now that I’ve been using forScore 5 for about a week, here’s a little show-and-tell about my favorite new features in this upgrade. You can click on any of the images for a bigger view. But first, let’s talk about bugs I’ve encountered in forScore 5.0.1. 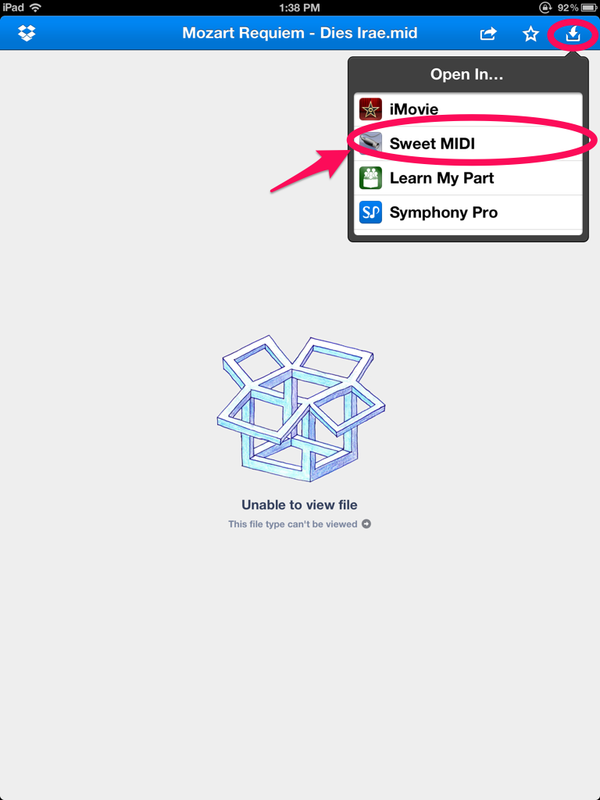 Not to beat a dead horse, but BACK UP your forScore library (both PDFs and the .4sb score data file) before you upgrade!!! 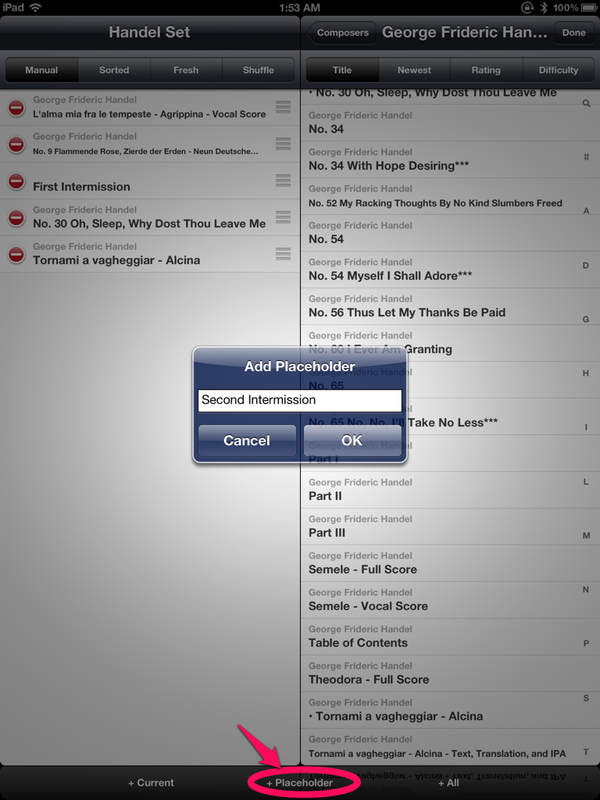 This saved me when my setlists vanished after the upgrade to version 5.0.1. I was able to restore them using the forScore backup file I made right before I did the upgrade. The upgrade did erase most of my settings, and I couldn’t restore those from the backup. I had to go into the Toolbox menu and re-enter them. The upgrade erased my custom pens (grrr) but NOT my custom stamps (whew!). 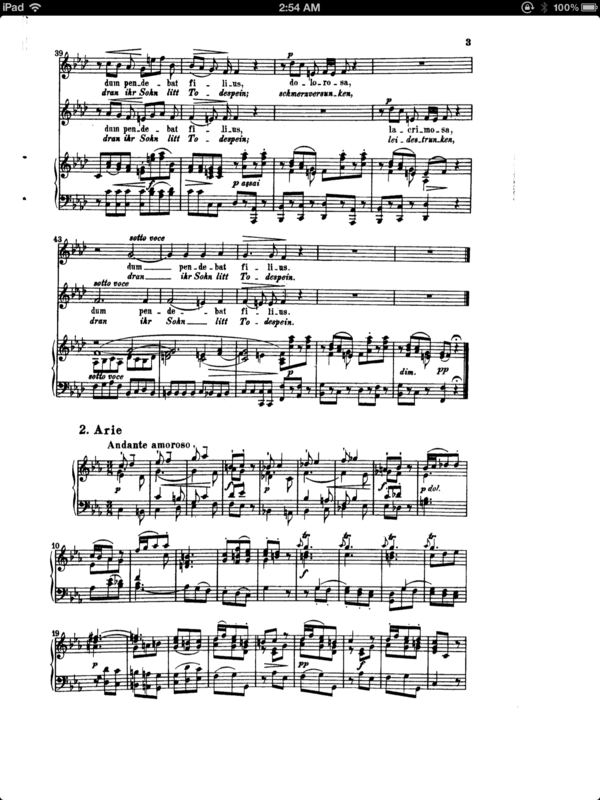 I ran into a issue with the global search tool (the magnifying glass icon) where searching for “Bach” yielded “Offenbach” but not “Johann Sebastian Bach”. 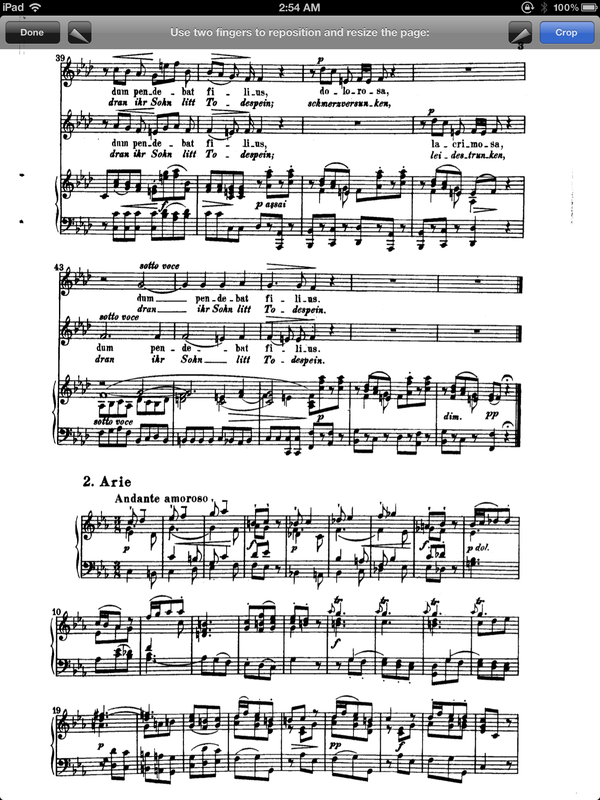 Although searching for “Sebastian” DID return “Johann Sebastian Bach”, oddly enough. 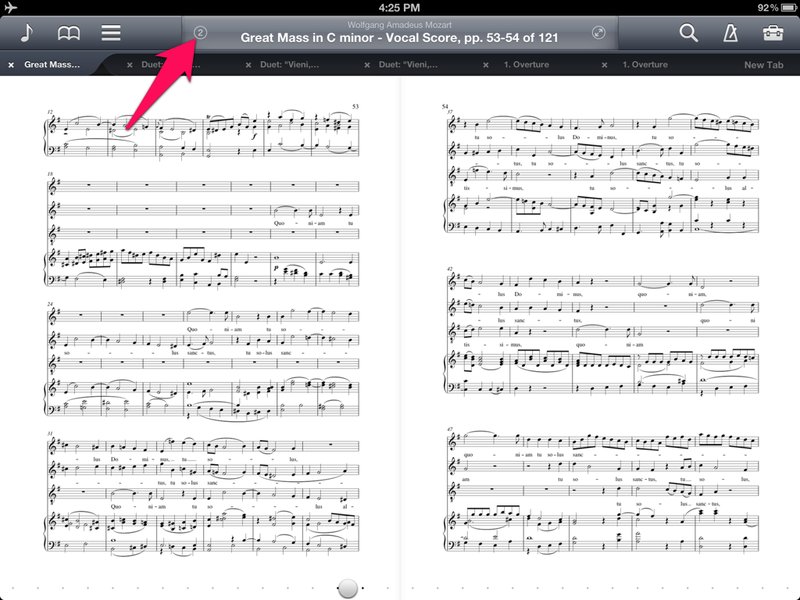 When the tab bar is open, it’s possible for the bottoms of scores to be cut off at the edge of the display. 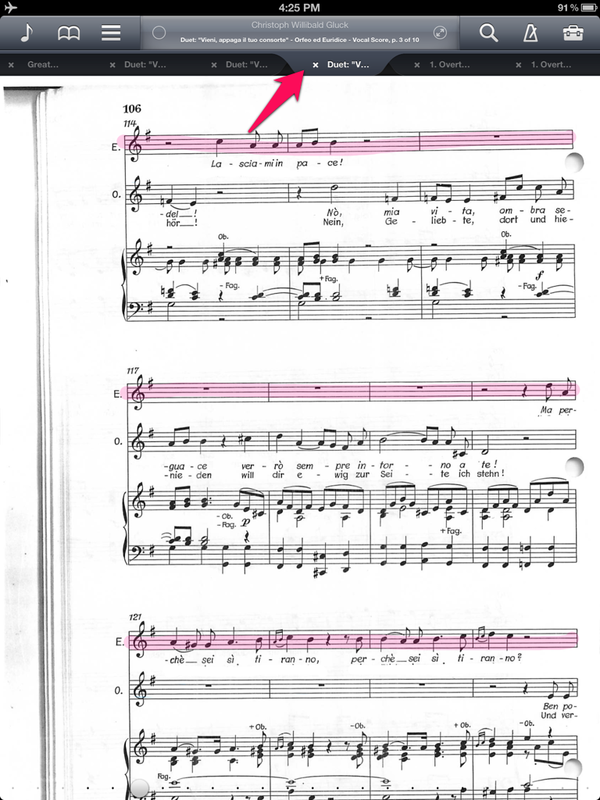 The most serious issue I noticed, other than setlists & settings being erased, was that during rehearsal last night, there were a few times when forScore froze or kept skipping over multiple pages during a page turn. I wasn’t able to isolate the exact conditions that caused it to happen, and I had to restart forScore for it to return to normal operation. That would of course be catastrophic during a performance, so I’m going to report that bug and hope that they can get to the bottom of it very soon. 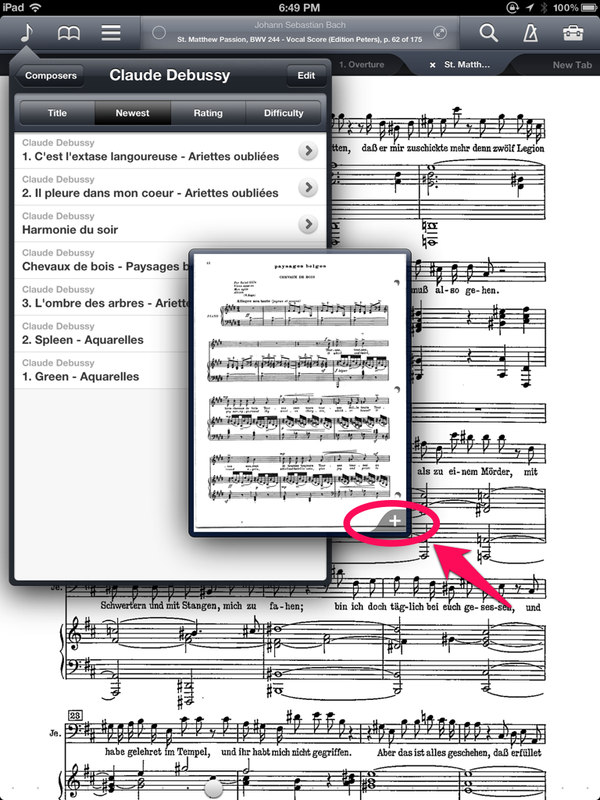 The jury is still out on the issue that I saw in forScore 4 where annotations would get “stuck” and not update when the page was turned (and it turns outs I’m not the only one who reported that problem). I haven’t seen it yet in forScore 5, but I’ll wait and see if it happens any more. 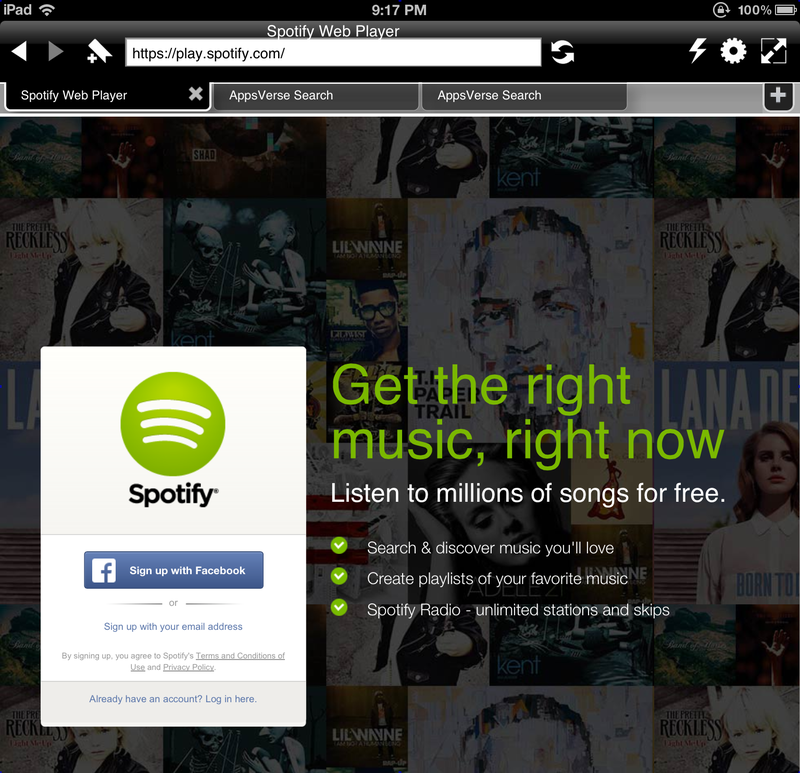 You can now view two pages side-by-side in landscape mode. 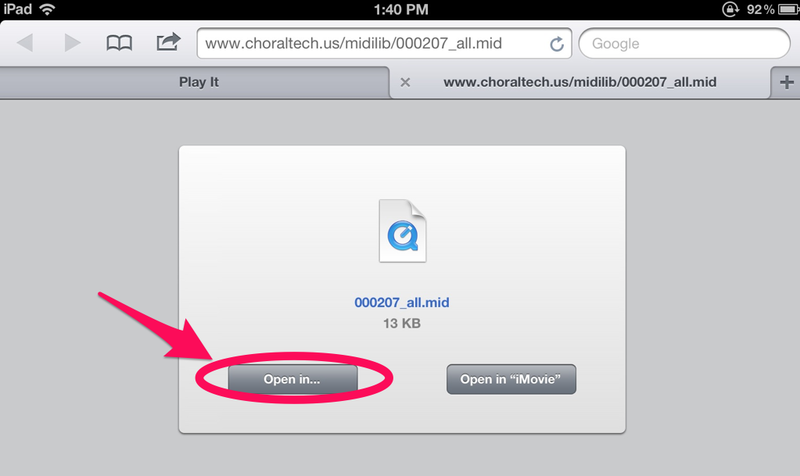 Tap on the number/circle icon to the left of the title when in landscape mode to toggle between one-page and two-page view. 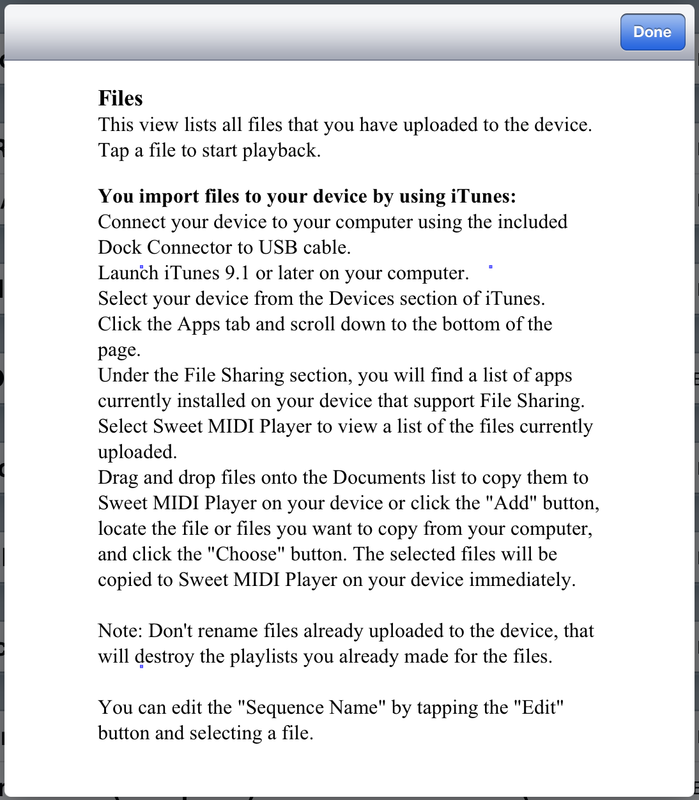 (The two-page view is rather small to read on the iPad, but may be useful if you have the piece almost memorized and just need a roadmap, or are visually skimming/searching though the piece. 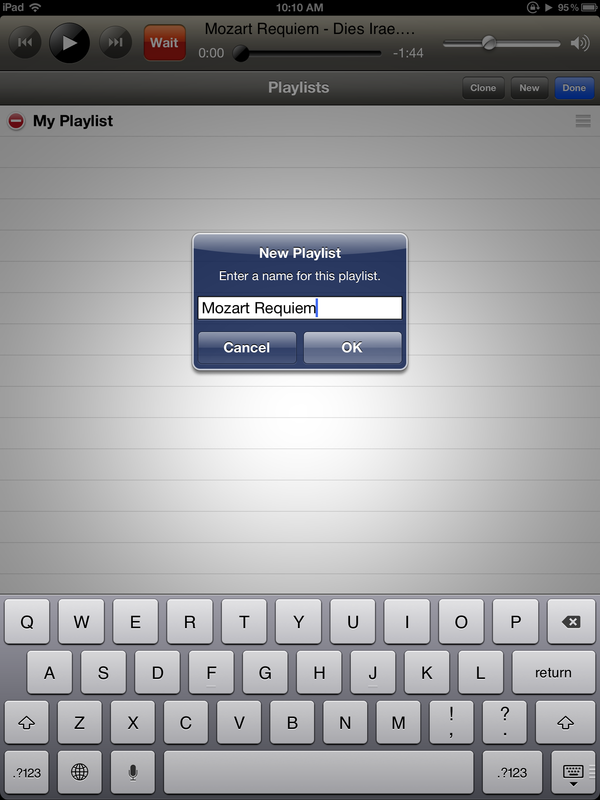 The two-page view is most useful when projecting the iPad to a larger display.) I posted a video demo of the two-up feature here. I love this. 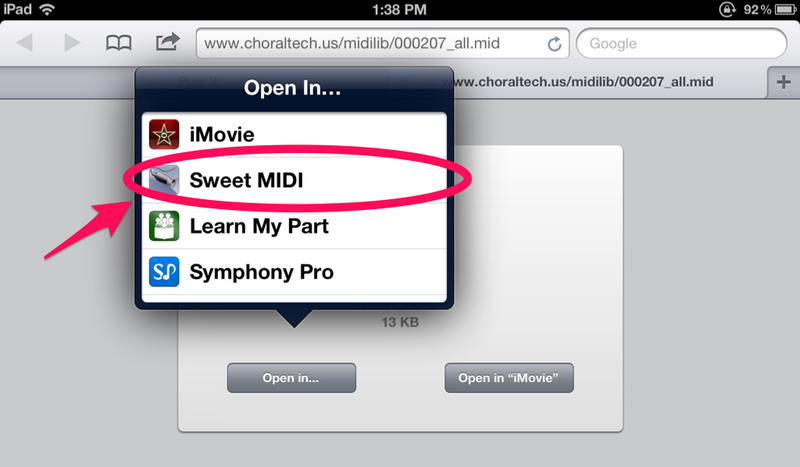 You can now have multiple scores open, each in their own tab, and switch between them. 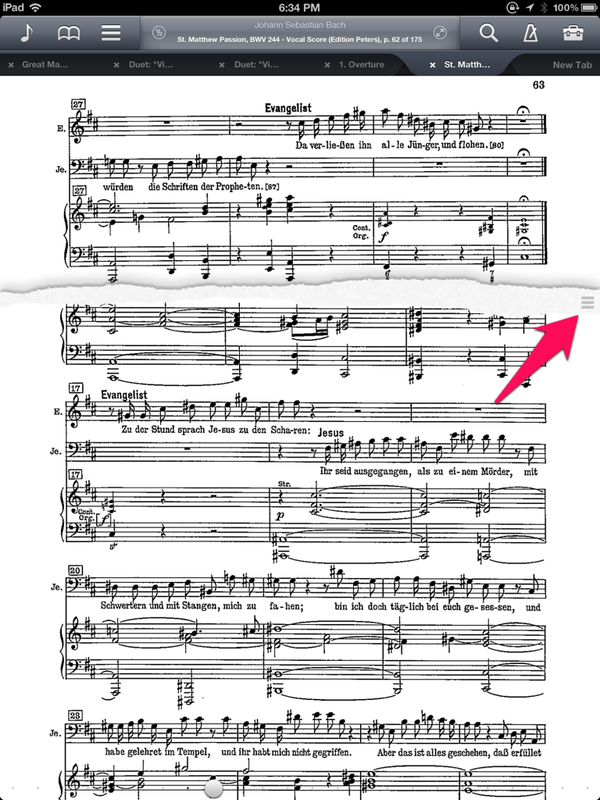 I do think this feature needs additional refinement to make it faster and more convenient to open a score in a new tab and also to switch tabs, but the current version is a step in the right direction. 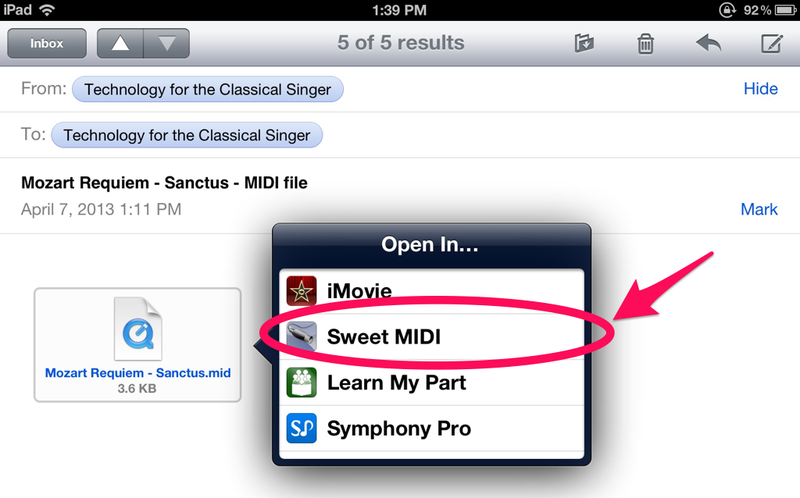 I posted a video tutorial on how to open scores in tabs here. 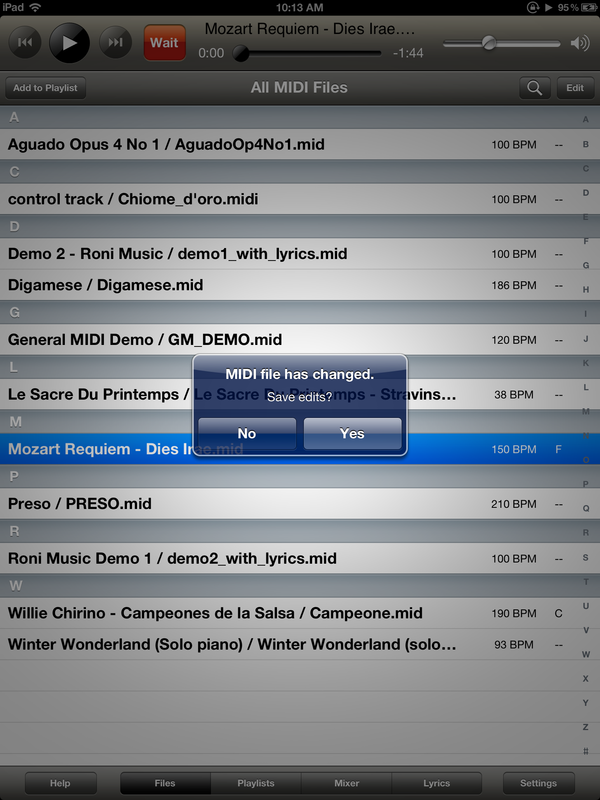 Now you can combine multiple PDF files into a single PDF. 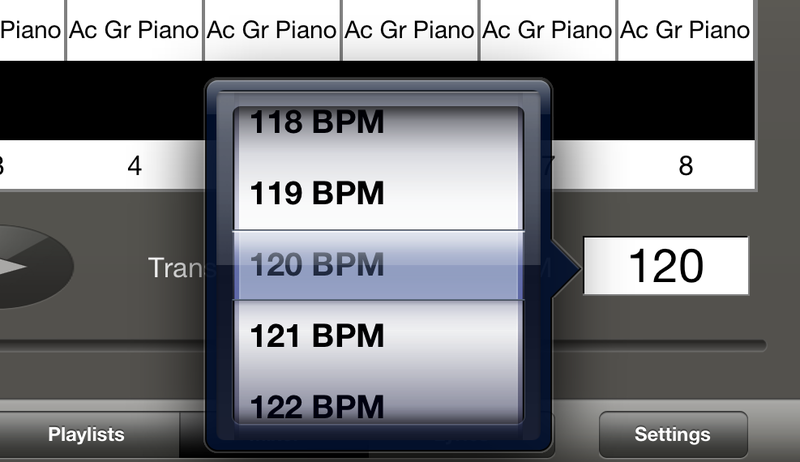 Just tap the “Edit” button in the Score menu, select the files to combine, then tap “Merge”. 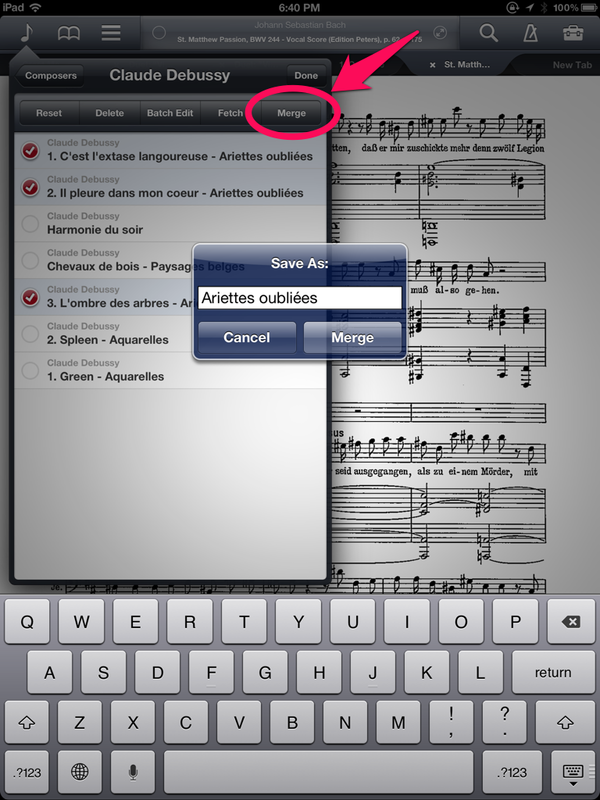 Very handy, and a nice complement to the existing Rearrange feature that lets you copy/re-order/delete pages in a score. 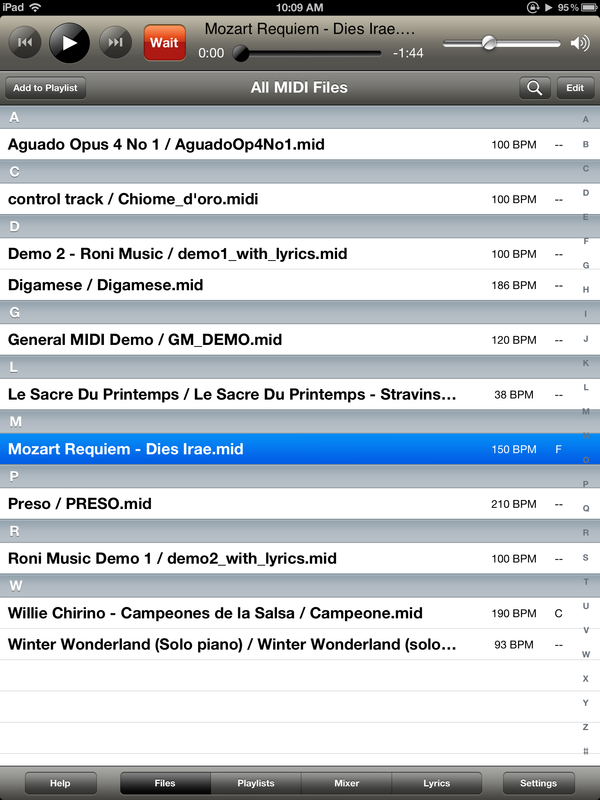 The setlist editor is now a snazzy two-pane window with the setlist on the left and your score library on the right – just browse and tap on scores to add them to the list. 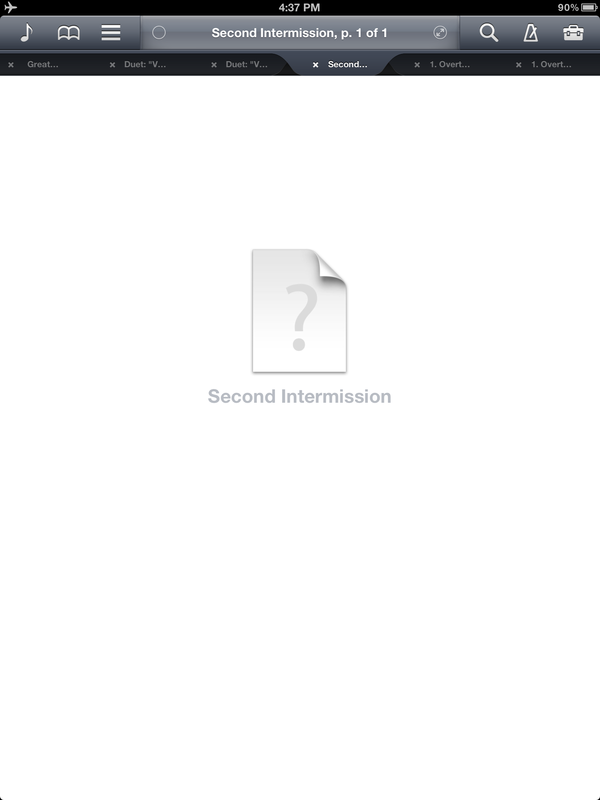 There is also a handy way to add placeholders to your setlist to represent intermissions, songs performed from memory or by other performers, etc. I’ve been desperate for this feature for a long while. 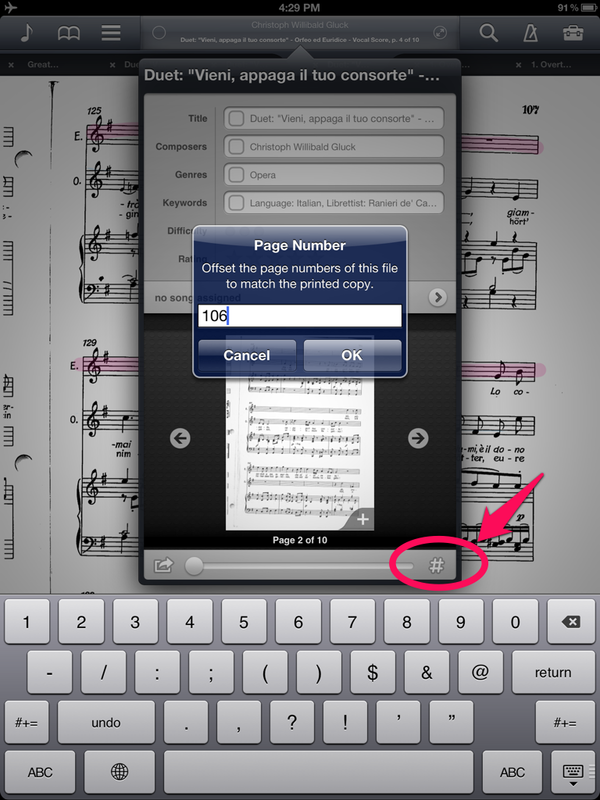 It lets you specify a numerical offset so that the page number displayed by forScore matches the page number printed on your sheet music. Great for finding your place during group rehearsals, as well as for navigating scores that were excerpted from a larger collection, like an anthology. 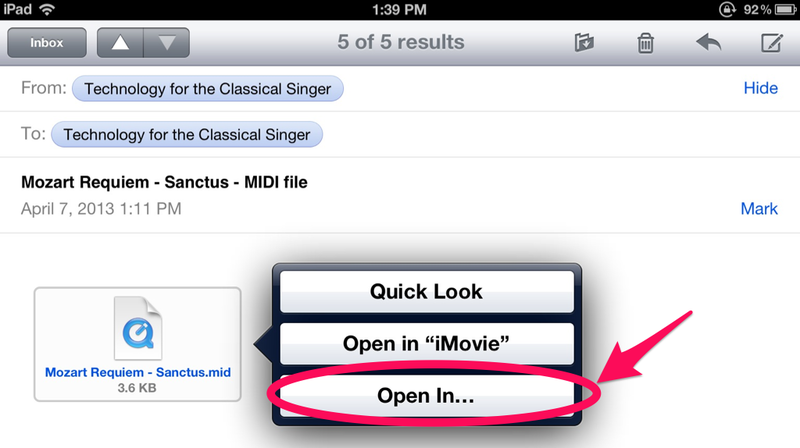 Tap the number symbol in the bottom right corner of the metadata window to enter the page number offset. 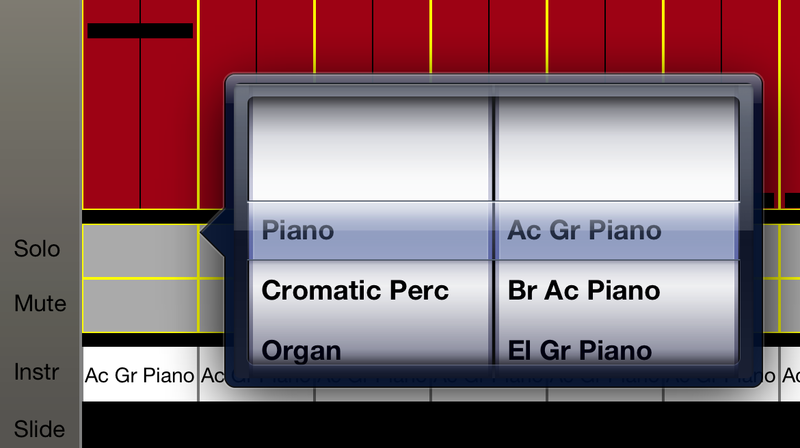 Also, I’ve heard from inside sources that future versions of forScore will support negative page offsets, with pages before 1 shown as Roman numerals. This is helpful for aligning the page numbers in scores that have front matter – cover, preface, table of contents – that cause the printed page 1 to appear later in the PDF file. The page break for half-page turns now has a slider so you can adjust where the break occurs on each individual page, see below. 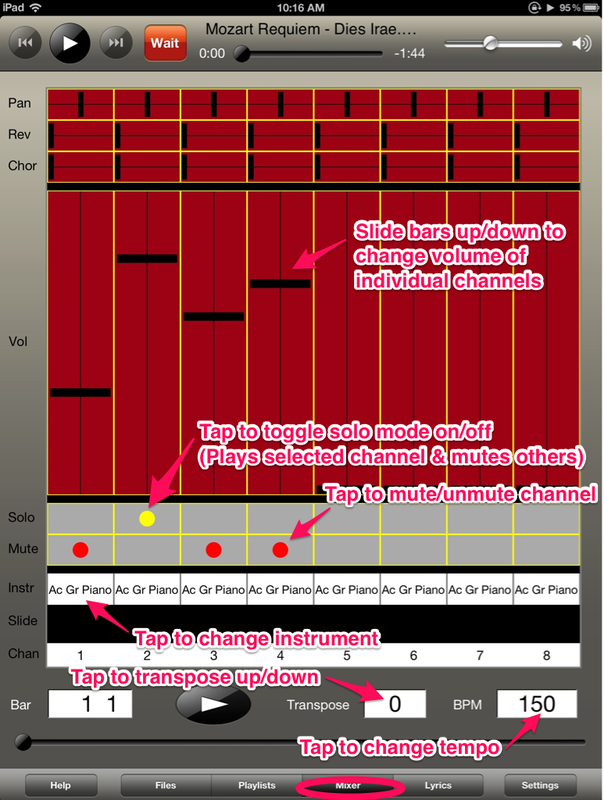 To read about the rest of the new features in forScore 5, check out forScore’s official list of new features and the forScore User Guide. 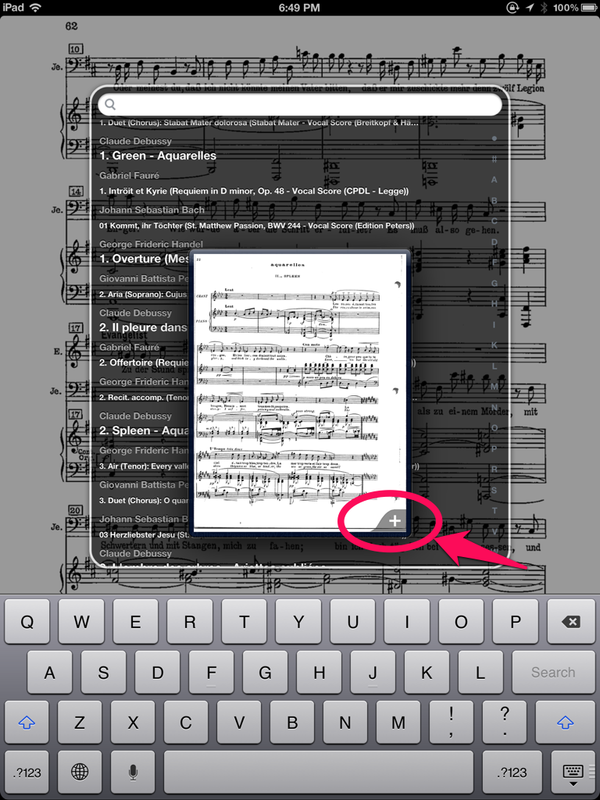 forScore 5 has been released – BACK UP your music library, fasten your seltbelts, and upgrade! Here’s a quickie video I made to demonstrate another favorite feature of mine in forScore 5 – the ability to view two pages of a score side-by-side.